The light combat tactical all-terrain vehicle (L-ATV) was developed by Oshkosh Defence. The Oshkosh L-ATV offers Mine Resistant Ambush Protected (MRAP) level protection. The L-ATV's TAK-4i intelligent independent suspension system enhances the ride quality and mobility in rough terrains. The Oshkosh L-ATV (light combat tactical all-terrain vehicle) successfully completed the SCORE Baja 1000 off-road race in the Mexican desert. The L-ATV can be transported by a wide range of military transport aircraft. The light combat tactical all-terrain vehicle (L-ATV) was developed by Oshkosh Defence as part of the Joint Light Tactical Vehicle (JLTV) programme. JLTV is a programme of the US Army and Marine Corps that is intended to replace part of the Humvee fleet with a new multirole light vehicle, offering superior crew protection and performance. 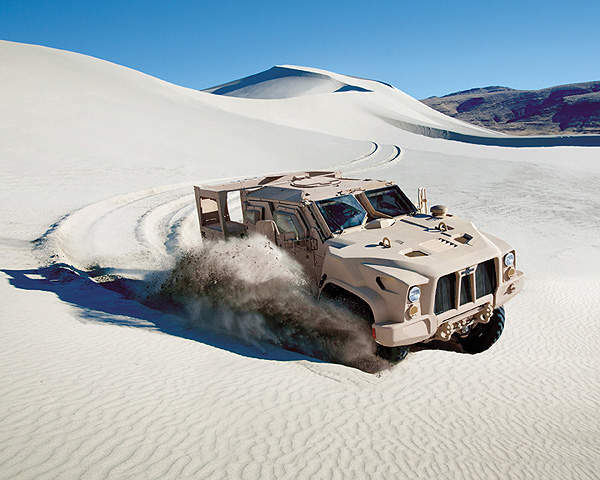 In January 2012, the US Army issued a Request for Proposal for the Engineering and Manufacturing Development (EMD) phase of the JLTV programme. Along with Oshkosh, five other teams confirmed their bidding for the EMD phase of the programme by March 2012. The vehicles offered were BAE Systems’ Valanx, General Tactical Vehicles’ JLTV Eagle, Lockheed Martin’s JLTV, Navistar’s Saratoga and AM General’s BRV-O. As part of the EMD phase, the army awarded three contracts to AM General, Lockheed Martin and Oshkosh, for the delivery of 22 prototypes per contract. The full EMD phase will take 33-months, of which 27 months will be allotted for period of performance. "Along with Oshkosh, five other teams confirmed their bidding for the EMD phase of the programme by March 2012." Oshkosh Defence began the L-ATV development in 2006 in response to the JLTV programme. 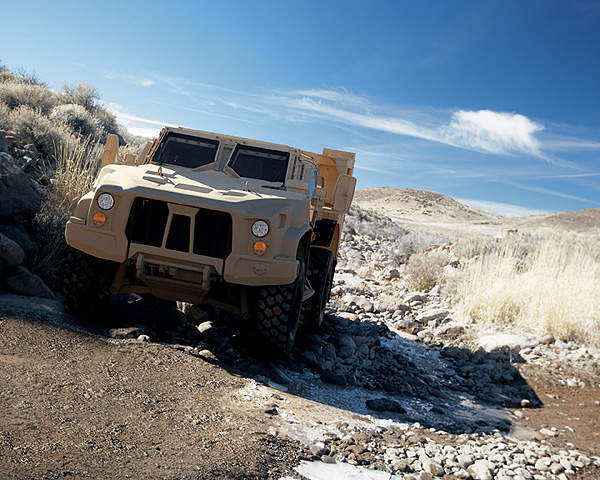 In spite of losing the technology development contract for the JLTV programme in 2008, Oshkosh unveiled the first prototype vehicle, known as LCTV, in 2010. 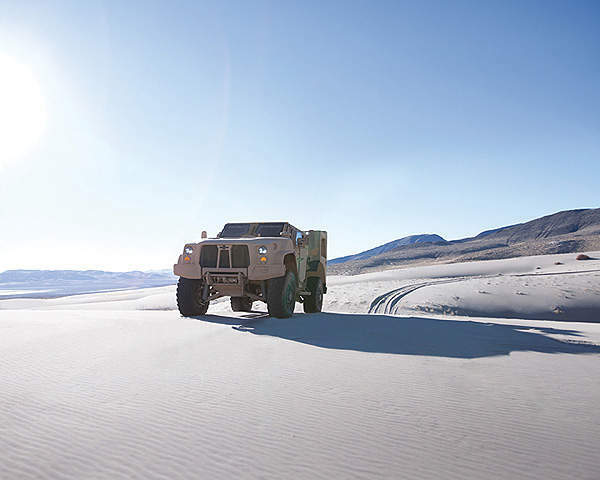 The company, however, re-entered the JLTV programme as the US Army and Marine Corps reset the requirements, schedule and cost of the programme. The L-ATV successfully completed the SCORE Baja 1000 off-road race in the extreme terrain of the Mexican desert in November 2010. Developed over six generations, it entered into EMD phase production in October 2012. The L-ATV utility variant for the JLTV programme was rolled out in February 2013. The vehicle was developed using the innovative technologies proven during the last ten years in Iraq and Afghanistan. The performance characteristics were checked through extensive mission-profile testing. The basic L-ATV comes with no standard weapon configuration. It can be mounted with a range of remotely controlled weapon stations. The turret can be fitted with a 7.62 or 12.7mm machine gun. Armament configurations vary, based on the mission requirements. The L-ATV is equipped with an advanced crew protection system, which offers a protection level similar to that of mine resistant ambush protected (MRAP) vehicles. The protection system can withstand underbelly blasts. The L-ATV can accept add-on armour packages to operate according to the mission requirements. The L-ATV developed by Oshkosh is equipped with a diesel engine delivering power to a high-output electric generator. 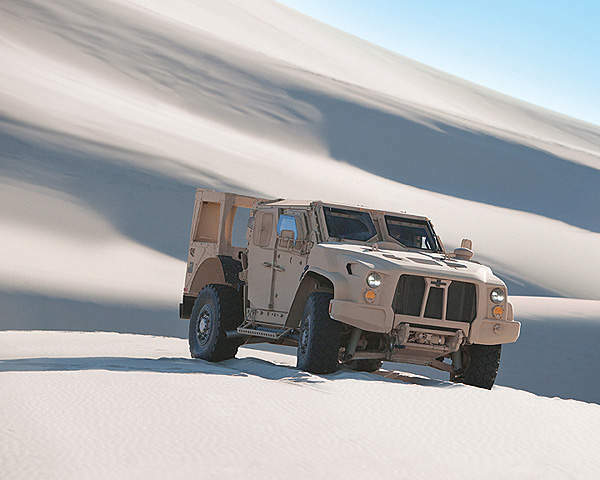 The optionally fitted ProPulse diesel electric powertrain is not a current requirement of the JLTV programme. The powertrain solution offers improved fuel economy, while allowing the vehicle to generate 70kW onboard and export power. TAK-4i is specially designed for high-performance, providing high mobility in rough off-road terrain. L-ATV is equipped with a TAK-4i intelligent independent suspension system, offering high levels of mobility and manoeuvrability to the vehicle. "As part of the EMD phase, the army awarded three contracts to AM General, Lockheed Martin and Oshkosh." The TAK-4i system is specially designed for high-performance, lightweight vehicles, providing high-mobility in rough off-road terrain. The suspension is coil sprung and offers 20 inches of travel, which is 25% more than any vehicle currently used by the US military. The system can be raised and lowered using internal controls. The suspension system improves the ride quality and load-carrying capacity, while offering reduced life-cycle costs. 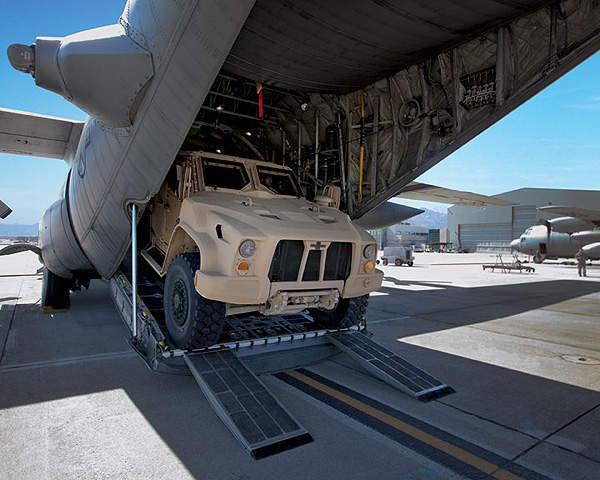 The compact design and dimensions of the L-ATV allow for the easy transportation of the vehicle by most of the military transport aircraft in the US Army. 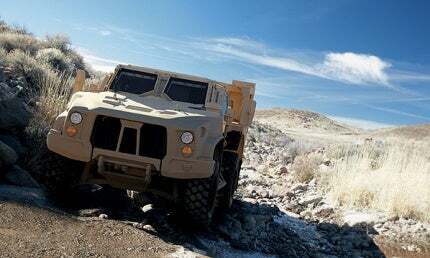 The joint light tactical vehicle (JLTV) is a new support vehicle programme being developed by the US forces, specifically the US Army, USSOCOM, and the Marine Corps. 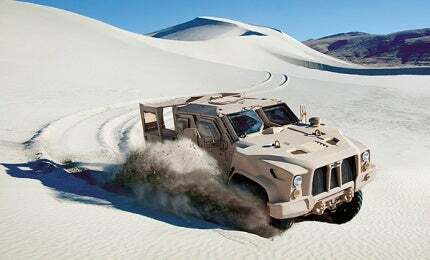 Lockheed Martin is developing a family of light tactical vehicles for the JLTV programme. The JLTV family of vehicles will provide protected transportation for troops and equipment across challenging battlefield environments.